RESULTS: Findings highlighted that, while tax incentives do play a role in decision making, various other non-tax factors drive South African businesses' decisions to invest in EE and/or RE projects. These businesses do not perceive the available tax incentives as effective, nor do they regard them as sufficiently motivating for businesses to change their environmental behaviour. They also feel that the government should reduce the burden of complying with the requirements of Section 12L (the EE allowance). South Africa is faced with a significant challenge of securing the supply of electricity, since the demand for electricity continues to grow within a supply-constrained environment. In addition to this challenge, South Africa faces the challenge of reducing its greenhouse gas (GHG) emissions, which directly contribute to climate change. The country ranks among the top 20 global emitters of GHGs and carbon dioxide (CO2) and is the largest emitter in Africa, largely because of its energy sector. South Africa has an energy intensive economy. Coal provides for approximately 65% of the country's primary energy needs and it is likely to provide the majority of the country's primary energy for the next few decades, as it is a financially attractive and abundant source of energy (PBL 2016; Republic of South Africa 2015a). More specifically, coal is used to generate approximately 91% of the electricity in South Africa (Eskom 2016). Coal combustion mainly results in CO2 emissions, which is the main GHG that has been linked to climate change, in South Africa (Cohen & Winkler 2014; Republic of South Africa 2004). The government of South Africa is establishing and growing a renewable energy (RE) industry, in line with its Integrated Resource Plan, through the Independent Power Producer Procurement Programme, in order to substantially reduce the country's CO2 emissions, to secure electricity supply and to diversify the country's energy sources (IPP Projects n.d.; Republic of South Africa 2010). In addition, the South African government has implemented measures to promote energy efficiency (EE), including the 2005 National EE Strategy, the National EE Action Plan of 2012, the EE Target Monitoring System of 2014 and the post-2015 National EE Strategy of which the first draft was issued for comment toward the end of 2016 (Republic of South Africa 2016c). The South African government recognises the country's role in the global efforts to reduce GHG emissions and has ratified the Paris Agreement on Climate Change at the 21st session of the Conference of the Parties to the United Nations Framework Convention on Climate Change (Republic of South Africa 2016b). There are various valid reasons for applying a combination of instruments, instead of only relying on a single instrument to address a given environmental problem. One such reason is that most environmental problems have 'multiple aspects' that need to be addressed. Often the effectiveness and efficiency of both instruments are enhanced when two instruments are combined (Braathen 2007). According to Braathen (2007), the ideal situation is one where everyone that contributes to a given environmental problem should have an economic incentive to alter their behaviour to become more environmentally friendly. He found that, in many of the cases that he examined, significantly higher environmental effectiveness could be achieved if economic incentives to reduce emissions had been granted to key categories of polluters. 1. Are tax incentives used globally to effect change in energy consumers' environmental behaviour, specifically regarding investment in RE and EE projects (even if through R&D), and is it an effective measure? 2. Are tax incentives used in South Africa to effect change in businesses' environmental behaviour, specifically regarding investment in RE and EE projects (even if through R&D), and is it an effective measure? 2.1 What are the available tax instruments in South Africa that can potentially stimulate investment in RE, or EE projects (even if through R&D)? 2.2 Do businesses utilise the available EE and RE tax incentives? 2.3 How important is the existence of tax incentives to businesses in deciding to invest in RE or EE projects? 2.4 What factors drive the decision making of businesses regarding investment in RE or EE projects? 2.5 Are the available tax incentives in South Africa effective in changing behaviour and stimulating investment in RE or EE projects? A representative of each company was requested to complete the questionnaire in respect of the South African group as a whole, where possible (in other words, representing the South African holding company included in the JSE Top 40 and all its South African subsidiaries). If this was not possible, possibly because the group is so diverse and consists of too many companies, each with different EE and RE practices, they were requested to complete the form for the holding company only (i.e., the entity included in the JSE Top 40), as long as the holding company is an operating company and not merely an investment holding company. Lastly, if neither of these could be done, the respondent was requested to identify the company's South African subsidiary with the largest energy usage and complete the survey in respect of that entity only. One of the 28 companies initially selected is merely an investment holding company and has no subsidiaries, therefore it was excluded from the study. Another company was also excluded, based on the fact that it operates in a decentralised environment and covers a host of industries and therefore the majority of the questions would be specific to the individual businesses. This group is also not energy intensive and the company with the largest energy usage is completely insignificant from a group context. A final number of 26 companies was therefore included in the study, and these received questionnaires. A list of these companies, together with the sectors that they operate in, is provided in Appendix 1. 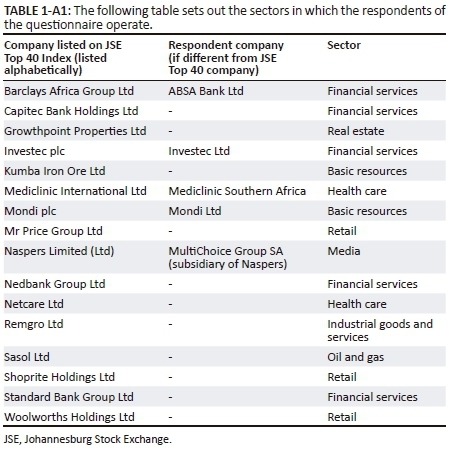 The reason for selecting the population from the JSE Top 40 is that it is likely that these companies would have invested in EE or RE and therefore that the questionnaire would be relevant to them. It is expected that investment in EE or RE would be important to these companies, since sustainability, which includes environmental aspects such as EE and/or RE, inter alia, is a core governance issue. The King Code on Corporate Governance for South Africa (the King Code) recommends integrated sustainability performance and integrated reporting and it is recommended that the integrated report have sufficient information regarding environmental, social and governance issues (Institute of Directors Southern Africa 2009). Although companies listed on the JSE are not required to comply with chapter nine of the King Code, which deals with integrated reporting and disclosure, it still needs to be applied by such companies on an 'apply or explain' basis (JSE 2013). In addition, high costs are associated with investment in EE and RE and it is expected that these large companies included in the JSE Top 40 would have the necessary resources or access thereto. A total number of 22 of the 26 companies in the population (and 30 of the JSE Top 40 companies) are also included in the JSE's most recent Socially Responsible Index (SRI) as at 27 November 2014 (JSE 2014a). This further strengthens the expectation that these entities would have made some investment in EE or RE, since this index identifies those companies listed on the All Share Index that meet certain environmental, social, governance and related sustainability criteria (JSE 2014b). The questionnaires were developed based on an understanding gained from performing a literature review. Some questions were formulated based on questions and wording used by Du Plooy (2012), as well as an international survey performed by PricewaterhouseCoopers (2010) to ensure that the questions are clear, unambiguous and appropriate for this study. Du Plooy conducted a study of South African vehicle manufacturers to investigate the possible implementation of a 'feebate' policy to reduce CO2 emissions and to determine if the current tax incentives available to South African vehicle manufacturers to invest in reducing CO2 emissions are utilised by them. As part of the PricewaterhouseCoopers study, almost 700 global executives of 15 countries were interviewed during the period September to November 2009, to determine their perspectives regarding the impact of climate change, the government's role in protecting the environment and which environmental policy tools they prefer, inter alia. Understanding businesses' current and planned RE or EE projects, including whether or not they utilise the currently available EE and RE tax incentives. The link to the electronic questionnaire, which was set up using SUrveys (a web-based survey program), was e-mailed to a representative of each of the companies selected for the study. Their contact details were obtained either directly from the companies' websites or from phoning or e-mailing the company. A total number of 26 questionnaires were sent out, of which 16 responses were received by the cut-off date. This represents a response rate of 62%. Although this appears to be a relatively small sample from an already small population, statistical differences could still be detected using ordinal data. The questionnaires were completed either by a senior representative in finance, tax or sustainability, mostly in consultation with one another where there was uncertainty about answering certain aspects. The data from the completed questionnaires was analysed statistically using Statistica 10.0 (StatSoft Inc.). To measure if, for a particular Yes/No question, the number of Yes's reported is significantly more than the number of No's (or vice versa), a conclusion is reached with a significance level of 5%, if the probability (p) of exceeding the observed number (x) of Yes's, assuming that there is no difference between Yes and No (i.e., actually 50%), is less than 5%. Consequently, whenever x = 11 or more from the n = 16 respondents, it was referred to as a statistically significant proportion of respondents. This number was determined using the binomial distribution, which is typically used to test for significance in qualitative data with only two options (i.e., Yes/No answers). Certain researchers regard tax incentives as effective, but only when used in combination with other instruments (CRS 2005). Other economists and researchers argue that tax incentives are generally redundant and ineffective when attempting to stimulate investment (Bird 2008). The benefits of investment tax incentives are often overstated, while the costs are often underrated or completely overlooked (Nathan-MSI Group 2004). Incentives focused on investment may be successful, but too often problems arise, inter alia, as a result of competing policies, substitutability between capital and other inputs, impact of long term incentives and competition from other countries. These problems can mitigate or exacerbate the impact of incentives (Calitz, Wallace & Burrows 2013). Tax incentives might be justified; however, it is important to remember that many other factors, including other economic, non-economic and social policy considerations, drive investment decisions (Calitz et al. 2013). There is empirical evidence on the effectiveness of tax incentives, but a country's overall economic characteristics may play a more important role than tax incentives (Zee, Stotsky & Ley 2002). The Nathan-MSI Group (2004) agrees that tax can affect investments, but that non-tax considerations are far more important in determining most investment decisions. Nevertheless, tax incentives are still widely used and continue to play a significant role in the tax policies of both developing and developed countries, despite varied opinions and inconclusive evidence about the use and effectiveness thereof (Calitz et al. 2013; Nathan-MSI Group 2004; Zee et al. 2002). Although some believe that tax incentives distort investment decisions and are often ineffective, inefficient and prone to abuse and corruption (Easson & Zolt 2002), tax incentives are likely to remain part of development policies globally (Calitz et al. 2013). Developed and developing countries, however, have very different approaches when it comes to tax disincentives on non-renewable energy sources. KPMG studied 21 major economies of the world to establish which tax instruments are used in the area of environmental policies (KPMG 2013b). Only the developed countries in its study make use of such penalties. Developing economies appear to avoid using such tax penalties, presumably on the basis that such penalties could damage development and growth prospects (KPMG 2013b). Anjum (2008) agrees that environmental taxes (disincentives) are not necessarily practical for developing countries, as they can affect a country's competitiveness. There are, however, various measures that can be taken to reduce the impact on a country's competitiveness. Van Schalkwyk (2012) also found that incentives to promote environmentally friendly behaviour are preferred to disincentives in developing countries. However, environmental tax disincentives can be effective in fighting climate change as they can lead to decreased pollution. In the long term, the circumstances of societies will improve and global warming will be reduced (Anjum 2008). 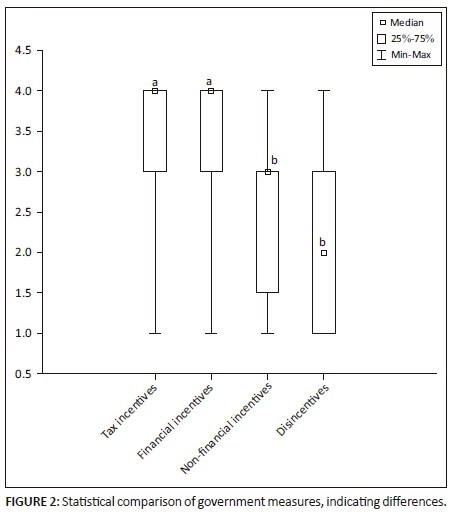 The perception exists that incentives, such as tax subsidies, tax credits and grants, have a much greater impact on consumer behaviour than taxes (disincentives), since they are perceived as a reward, while taxes are seen as punishment. There is, in fact, empirical evidence that incentives are generally more effective in swaying customers toward RE and EE than environmental taxes (Bennet & Moore 1981). According to Niesing (2012), government regulations alone are not enough to reduce demand for energy, and energy prices and incentives have a significant role to play. It has been demonstrated in a variety of contexts that investment, tax credits are powerful instruments for inducing investment and Hassett and Metcalf (1995) have found that tax incentives increase the probability of investing in EE capital. They also found that consumers (individuals) respond in a rational way to energy-conservation incentives. According to Zhou, Levine and Price (2010), the use of tax and fiscal policies, such as taxes on energy consumption, tax rebates for EE and tax credits for investment in EE measures, inter alia, have been found to be effective instruments to encourage EE in certain countries. 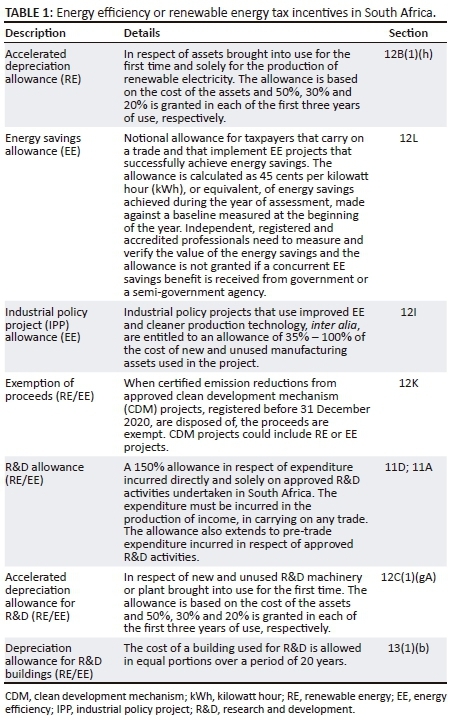 It is difficult to conclude on the effectiveness of tax instruments in achieving EE since evidence is sparse (KPMG 2013b), although one example of the success thereof is the Dutch energy investment allowance scheme that contributed to the country's increased business investment in EE in 2012 (Lomas 2012). Tax incentives aimed at encouraging R&D have the potential to encourage R&D of RE and EE technologies, which could, in turn, contribute to the reduction of emissions from electricity generation. KPMG found that 18 of the 21 countries studied, use their tax systems to promote R&D. This is because innovation is critical to governments' environmental policy goals. R&D drives down the cost of technologies, improves the business case for private sector investment, reduces costs to governments and enables solutions to be delivered at scale (KPMG 2013b). The only tax disincentives applied in South Africa that could have an impact on EE or RE is an environmental levy of 3.5 cents per kWh that is levied on electricity generated from non-renewable sources and an environmental levy of 400 cents per incandescent light bulb sold, which is either manufactured in or imported into the Republic of South Africa (Republic of South Africa 1964). The environmental levy was increased to 600 cents per electrical filament lamp with effect from 1 April 2016. A carbon tax is, however, being considered by the South African government. A draft Carbon Tax Bill was published in November 2015 and a revised version (considering public comments received) will be published for public consultation by mid-2017 (Republic of South Africa 2016a, 2017a). The proposed tax and its date of implementation will be considered further in Parliament later in 2017 (Republic of South Africa 2017b). Responses from industries to the proposed carbon tax have varied 'from cautious acceptance to clear rejection', with the main objection being that the tax will limit economic growth and impact negatively on job creation (Barnard 2016). This is the same reason that the literature suggested why developing countries tend to avoid environmental tax disincentives. 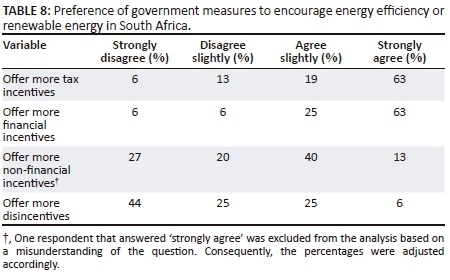 A non-significant majority of the respondents (63%) indicated that the availability of tax incentives was either not important at all or only slightly important to them when deciding whether or not to implement EE or RE measures, as set out in Table 3. The respondents, however, have varied opinions, since 38% of them indicated that it was actually fairly important to them. To make comparisons, 'not important at all' and 'only slightly important' were grouped together (as a 'no') and compared with the grouping of 'fairly important' and 'very important' (a 'yes'). In addition, all of the respondents indicated that they would still have invested in EE or RE, even if there were no tax incentives or no government incentives available at all. This highlights the fact that, although the availability of tax incentives is considered important to some businesses, non-tax factors seem to drive investment decisions regarding RE and/or EE. The next section explores which factors are regarded as the most important to businesses when they consider investment in RE and/or EE projects. 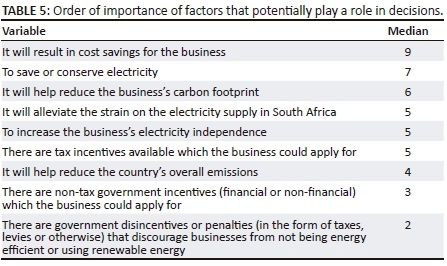 The top influencing factors that play a role in the decision making process of businesses regarding the implementation of EE or RE measures, as indicated by a statistically significant proportion of respondents, are to save or conserve electricity, the fact that it will help reduce a business' carbon footprint, that it will alleviate the strain on the electricity supply in South Africa and the fact that it will result in cost savings for the business, as indicated in Table 4. Only 31% of the respondents indicated that the availability of tax incentives play a role in the decision making process. The top four influencing factors (in terms of the number of respondents that selected them) were compared using Cochrane's test for nominal data (Yes/No answers). Cochrane's test statistics value is Q = 3 with degrees of freedom (df) = 3 and p-value = 0.392, which is > 0.05, so these chosen influencing variables do not differ significantly. Next, considering the ranking of these variables, a clearer picture emerges. The possible influencing factors were ranked in order of importance by the respondents. A value of '9' was attributed to the most important aspect for businesses, while '1' represented the least important aspect. The median was then calculated for each factor (refer to Table 5), to determine the factor with the highest preference. It was clear that five respondents did not change the given order, when asked to list the nine factors in order of importance. Since these answers most likely do not represent the true order of importance for these respondents, these five were excluded from the calculation of the medians. The top factor influencing business decisions regarding EE or RE is cost savings, followed by saving electricity and reducing a business' carbon footprint, as indicated in Table 5. Once again, the availability of tax incentives was only moderately important, based on a median of '5'. Using Friedman's test for ordinal data (where Friedman's test Chi square statistic = 29.92, df = 8 and p = 0.0002, which is < 0.05), it could be determined that these nine medians in Table 5 differ significantly. Using a Friedman-test in Figure 1, it is clear that the values attributed to 'cost savings' by respondents ranged from '5' to '9' (on a scale of '1' to '9'), with the distribution significantly skewed to the top (it has a median of '9'), that is to say, the majority of the respondents gave it the highest possible rating of '9' (the most important aspect). 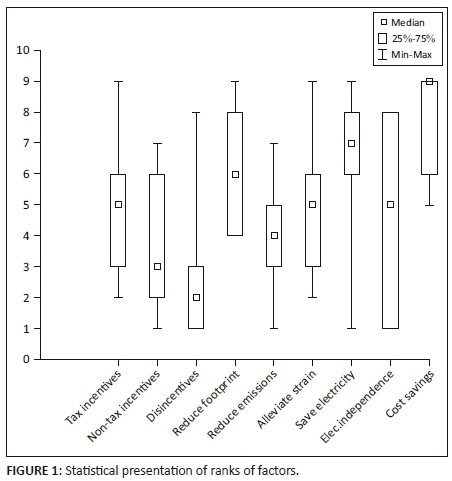 The results of 'tax incentives' (given a median of '5') vary and range from some respondents giving it a very low '2' to others giving it the highest possible score of '9'. Based on the results in Tables 4 and 5, it is clear that, even though the availability of tax incentives plays a role in decision making, other non-tax factors appear to drive businesses' RE and/or EE investment decisions. 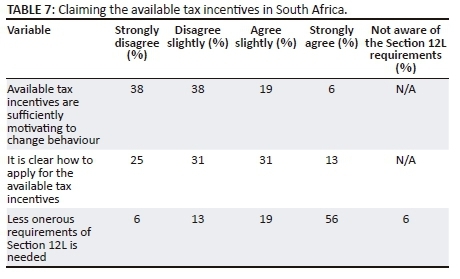 A large majority (76%) of respondent South African companies indicated that they do not perceive the currently available tax incentives to be effective in changing behaviour and stimulating investment in RE or EE, or that they only regard them as slightly effective, as summarised in Table 6. Responses varied from 'not effective at all' to 'fairly effective', but none of the respondents regard the available tax incentives as very effective. 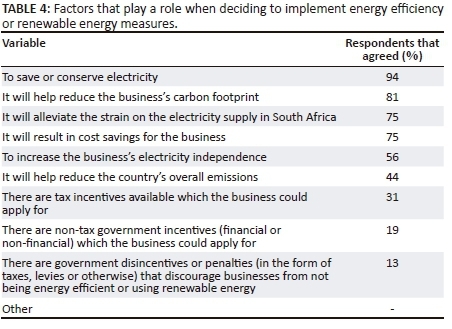 A statistically significant proportion of respondents (76%) disagreed (either strongly or slightly) that the available tax incentives for EE and RE in South Africa are sufficiently motivating to induce a change in businesses' environmental behaviour, as set out in Table 7. South African businesses appear to favour tax and other financial incentives over non-financial incentives and disincentives, to encourage EE and RE. Table 8 indicates that a statistically significant proportion of respondents (82%) agree (either slightly or strongly) that the South African government needs to offer more tax incentives and 88% agree (either slightly or strongly) that more financial incentives, such as tax incentives, subsidies, grants or purchasing rebates, are needed to encourage EE and/or RE in businesses. In order to make comparisons, 'strongly disagree' and 'disagree slightly' were grouped together (as a 'no') and compared with the grouping of 'agree slightly' and 'strongly agree' (a 'yes'). A statistically significant proportion of respondents (69%) feel that the number of disincentives should not be increased. The mean was calculated for each of the statements contained in Table 8, using the following scale: 1=strongly disagree; 2=disagree slightly; 3=agree slightly; 4=strongly agree. Using a non-parametric repeated measures analysis of variance test, i.e. a Friedman's test (where Friedman's test Chi square statistic = 20.13, df = 3 and p = 0.00016), it is clear that the results of the first two statements (government should offer more tax incentives and more financial incentives) differ statistically significantly from the results of the second two statements (government should offer more non-financial incentives and more disincentives). This is illustrated in Figure 2, using lettering from a Bonferroni multiple comparisons procedure. Financial incentives (including tax incentives) are clearly preferred to non-financial incentives and disincentives. The findings from the questionnaires suggest that not all businesses that potentially qualify for the existing tax incentives aimed at promoting EE and RE, utilise the tax incentives. The reasons for this warrant further investigation. The respondents have varied opinions about the importance of tax incentives in decision making, with responses ranging from 'not important at all' to 'fairly important'. The top influencing factors that drive decision making regarding the implementation of EE and/or RE measures (as indicated by a statistically significant proportion of the respondents), are to conserve electricity, the fact that it will help businesses reduce their carbon footprint, that it will alleviate the strain on the electricity supply and that it will result in cost savings for the business. The top factor influencing business decisions regarding EE and RE (when respondents were asked to rank a number of factors in order of importance) is cost savings, followed by saving electricity and reducing a business' carbon footprint. Although tax incentives play a role in the decision making of South African businesses, many non-tax factors drive investment decisions, similar to what the literature suggest about the global situation. The literature review revealed that tax incentives could effectively address environmental challenges and change consumer behaviour, although tax incentives are generally more effective in combination with other policy instruments. Some argue, however, that tax incentives are ineffective, because non-tax considerations have a larger impact on investment decisions and many factors besides tax instruments drive investment decisions. Although there are varied opinions about the use and effectiveness of tax incentives, they remain an integral part of countries' tax policies and it is expected that they will continue to be used globally. Findings from the questionnaires highlighted the fact that, although tax incentives do play a role in decision making, various other non-tax factors drive South African businesses' decisions to invest in EE and/or RE projects. These businesses also do not perceive the available tax incentives as effective, nor do they regard them as sufficiently motivating for businesses to change their environmental behaviour. However, improving the available RE and EE tax incentives in South Africa, might result in more businesses considering the implementation of RE or EE projects. South African businesses feel that the government should reduce the burden of complying with the requirements of Section 12L (the EE allowance). It is therefore recommended that the process to claim the currently available RE or EE tax incentives is simplified, the requirements are reduced or simplified and the financial benefit increased or more incentives made available to encourage businesses to change their environmental behaviour. Alternatively, the implementation of the proposed carbon tax (a tax disincentive) in South Africa could play a role in altering businesses' environmental behaviour.